Everyone loves an end of year list, and your Meriam Library staff and faculty are no different! So here for you curious readers is our list of favorite titles of those we read in the past year. Our favorites span fiction in multiple genres, history, food/earth science, and business, and we hope you'll find something to enjoy here. Where the library already owns a copy, those have been linked to OneSearch -- but we'll soon have all of these titles available for checkout. Grab your own new favorite to enjoy a little break from screentime over the holiday break! Do you have a favorite to share? 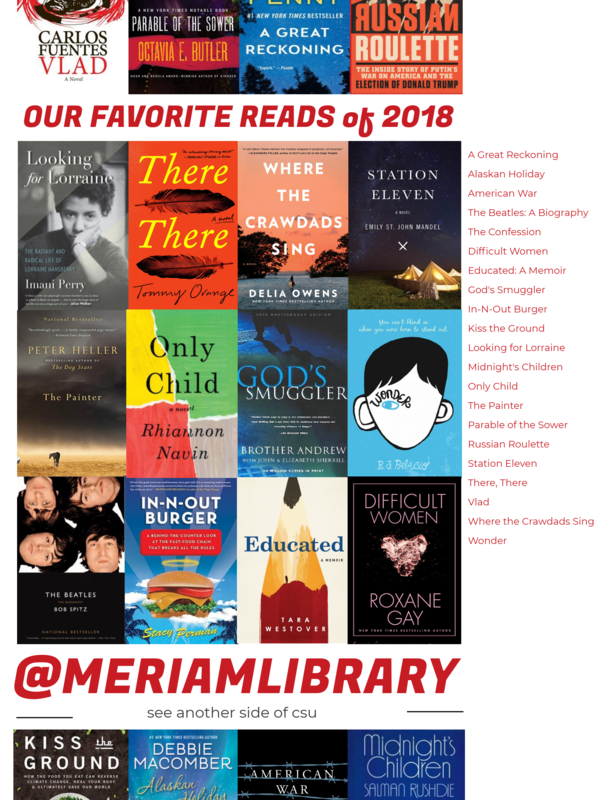 Post the title in the comments, or befriend @meriamlibrary on Instagram and share your favorites there! We'd love to hear what your reading, and if we don't have it to lend, your suggestions may end up on our shelves for others to see!